A printed copy of the Laws of 1783, chapter 31, this law was passed to aid Patriots who lost goods or property during the Revolutionary War. Source: New York State Archives. New York (State). Dept. of State. Bureau of Miscellaneous Records. Enrolled acts of the State Legislature. Series 13036-78. 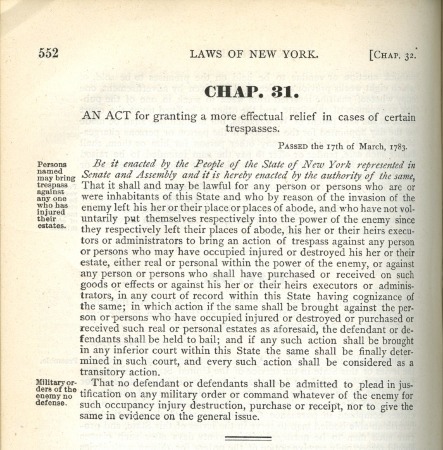 Laws of 1783, Chapter 31, printed.